Beautiful executive home in desirable Woodmont. Cook gourmet meals in this chef's dream kitchen which is open to the bright and airy great room with two stories of windows and custom bookcases. The adjacent enclosed sunroom, deck and private backyard are perfect for entertaining. Celebrate in style in the formal living room and dining room with trey ceilings, skylight, large his&her vanities, his&her closets with custom shelving, and decorative columns. Two bedrooms share a Jack-n-Jill bath, while the 4th bedroom has an en-suite bath. A flexible office or 5th bedroom with adjacent full bath is on the main level. Finally, the large unfinished basement with wine cellar meets all of your storage and workroom needs. You will LOVE this Spacious house!!! Gourmet Kit w/Granite c-tops, Upgraded cabinets, Tiled backsplash, Hardwood floors throughout the main level with wall to wall carpet upstairs. Four bedrooms with three full baths, includes guest suite on main with full bath. Large master bedroom with sitting area that leads into a spacious bathroom with double sinks. Oversized master closet. Two-Story Foyer. Separate dining, living, Fireside Two-Story Family Room. Full daylight unfinished BASEMENT. Professionally designed, gorgeous, private, peaceful backyard. OVERSIZED beautiful deck .This house is in immaculate condition and move in ready. Perfect location to downtown Duluth, malls, golfing, I-85, and other great shopping. This lovely 4 bedroom, 3 bathroom home is located on a cul de sac and features a rocking chair front porch. The formal dining room and family room have lovely hardwood floors and the eat in kitchen is equipped with granite counter tops, electric stove, refrigerator, dishwasher, microwave and opens to a huge deck which overlooks a small lake. The master suite features a ceiling fan, double vanity and separate shower. Two guest bedrooms and a guest bathroom are located on the main level. on the basement level you will find a bedroom, sitting room and full bathroom. The 2 car garage is equipped with automatic openers. Please contact Realtor for showings. Beautiful and spacious six bedroom home in the sought after Summergrove location. Close to schools, shopping, medical and highway. This home has numerous upgraded features and a large private back yard. The garage has room for 2 large vehicles plus has a storage room and utility closet. The basement is completely finished and could be a separate in-law suite. Generous in design and detail, this is a place anyone would be happy to call home. This beauty sits on a large corner lot, features an open floorplan with a bright airy kitchen, new blinds throughout, newish stainless steel appliances, extra storage area in the floored attic and garage, and much more! 5 Bedroom 5 Bath in heart of Crabapple w/a pool! Open floor plan, formal dining room, living room & family room. 3 car detached garage w/ bonus work space. Large bedrooms all w/baths. Bonus work space off pool/courtyard can be hobby space, office, or pool-side cabana room. Tiled screened porch overlooking Pebble Tech salt water pool oasis. Top of the line surround sound, superb landscaping, fenced flat yard & cul-de-sac. 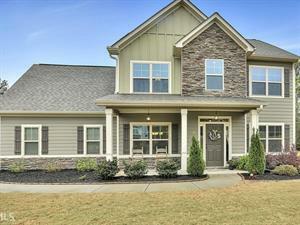 Conveniently located in Marietta/West Cobb just minutes from the Square. Master on Main. Chef's kitchen w/white cabinets, granite countertops, stone backsplash and stainless appliances opening to dining room. Family room with vaulted ceiling. Walnut hardwoods throughout most of main level. Updated powder room on main. Large sun room w/entry to MBR and to deck overlooking private backyard. Partial daylight basement, unfinished. Updated windows and energy efficient HVAC. HOA w/pool. Hillgrove HS district. Gorgeous move-in ready stucco! 5 BR 4 BA updated cul-de-sac home located in the sought after Kingston Crossing swim/tennis Community. Located with easy access to shopping, eating and the downtown. On the main floor, this home boasts hardwoods, separate Dining room, Office and Bedroom. Kitchen has been updated with granite and newer appliances. Large secondary bedrooms and a full basement with bathroom. Private backyard. Great schools, wonderful swim/tennis neighborhood! Split bedroom plan with high ceilings in the living areas, 9 ft. ceilings in the bedrooms. Great room flows into the dining area. Country kitchen with sunny breakfast area. Master suite features walk-in closet, tub, separate shower, 2 separate vanities. Tile floors in bathrooms, real bamboo hardwood floors throughout living areas. Full-length deck adorns the back of the home, ideal for grilling out and enjoying the natural wooded backyard. Less than 5 minutes from Canongate Elem. and Northgate High.